121” wide x 224” deep x 137” high. Unit includes an infeed and outfeed powered roller conveyor for efficient loading and unloading of bulk bags. Powered rotary lift table with 48” of travel, 4,000# capacity, and a chain driven live roller conveyor top allows for complete conditioning of a wide range of bag sizes. Rotary lift table includes a dedicated variable frequency drive for a smooth accurate operation. 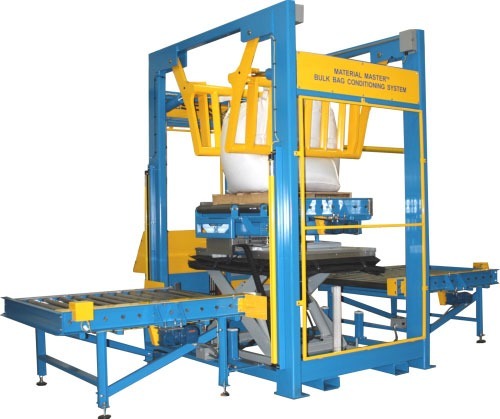 Machine features acrylic guards on two (2) sides with load side and unload side light curtains for operator safety. Hydraulic system includes a variable frequency drive and utilizes a proprietary PLC program to deliver accelerated equipment cycle times.